I’m so excited for this year’s Celebration of Smiles Event!!! For a small donation of $24 you’ll receive a complimentary 5×7 gift print and a mini-session (about 20 minutes). By participating, you’ll help support Operation Smile, which provides free surgeries for children around the world who suffer with cleft lips, cleft palates and other facial deformities. For every 10 individuals we photograph, another child will receive the gift of surgery! It costs as little as $240 for Operation Smile’s medical volunteers to provide a life-saving surgery that can take as little as 45 minutes. One hundred percent of each donation will go to Operation Smile. 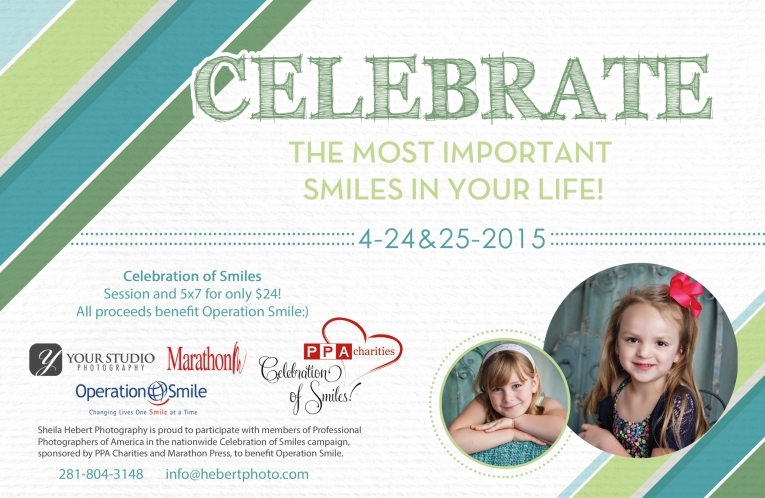 To schedule your session time for Celebration of Smiles, please call or email today (info@hebertphoto.com 281-804-3148). These days, photography is practiced by anyone with a smartphone, but it’s mastered by few. For everyday photos, you may be fine with a neighbor, a friend or your sister-in-law (no offense!). But when it comes to those once-in-a-lifetime moments-when you’ve got one shot at getting it right-you better make sure the person behind the camera is a pro. A proven professional photographer that is. There’s no greater proof than when the letters “CPP” follow a photographer’s name. They designate a Certified Professional Photographer, someone who is putting in the extra work to stay above the rest. It assures you of this photographer’s professional knowledge and experience, while also declaring that photographer as one who has achieved and maintains a higher standard. Certified Professional Photographers must complete a written examination, an image evaluation, and adhere to a stringent code of conduct. Certification must be renewed on a periodic basis, ensuring continuing confidence in the professionalism of Certified Professional Photographers. I, Sheila Hebert, CPP earned this designation after meeting rigorous requirements measuring my artistic and technical competence towards the end of 2013 (PPA member since 2008, but a CPP since 2013). And let me tell you, it was no piece of cake. I’d be lying if I said I knew I’d pass the first time (I did pass the first time…but I had my doubts). Why I wanted this certification degree? Because it was a personal challenge to raise the bar in my business & photography. More importantly it gives my clients (present and future) a sense of security & relief knowing that when they hire me, I have the skills needed to do the job. No worries – I’VE GOT THIS! Does this mean I never make a mistake…HEAVENS NO! But being a professional means I accept it, make it right, and move on. Professional Photographers of America currently recognizes less than 2,000 Certified Professional Photographers in the WORLD. A few weeks ago I had the opportunity to be a part of a very special event – Greater East Montgomery County Chamber of Commerce’s Principal of the Day Event. This event connected local schools and local businesses by allowing business owners (and/or employees of) to be a “principal for a day”. Everyone agreed that this event “opened their eyes” in a way they have never thought of before. Sure we’ve all been in a classroom as a student, but how many have actually been in a classroom or school as a leader? They have a very interesting job to say the least. I have a very special place in my heart for the education system and think that events like this will help bridge the gap between school, businesses, and communities. My main “job” of the day was to really photograph everyone who participated with the Cow from Chick Fil A (who doesn’t want a picture with the cow, right???). However, the cow never showed up. Lots of questions about where he could be and it wasn’t until after the event that we learned what happened. The cow had an accident and demolished his car!!! Poor cow – I’ve heard he was okay after accident and I sincerely hope that’s the truth. But the big question people we’re asking…WAS HE WEARING THE COW SUIT??? Poor Cow! So here are a few photographs from the event. 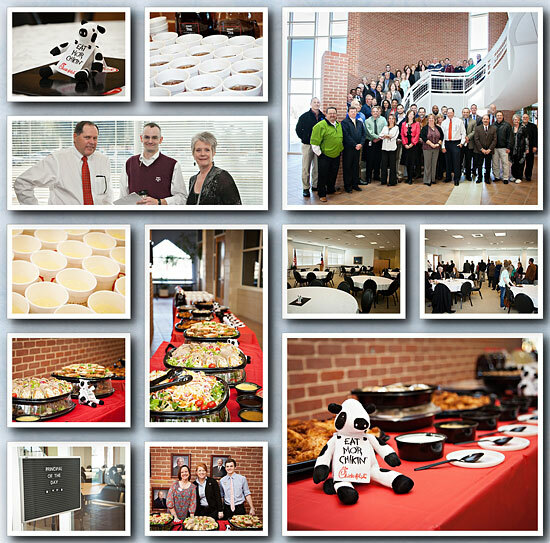 As you can see, the event was catered by Chick Fil A and was YUMMY!!! As a board member of the GEMCCC and a committee member of the Education Committee…THANKS to all the schools (and the principals) and businesses that participated in this event! You are both very much appreciated! And thanks to Chick Fil A of Kingwood for the delicious lunch! Here’s sneak peek of a personal project I’m working on. I photographed this with a vision, but the vision is not surfacing as I edit. So I’m not sure where I’m going with this image??? Sometimes that happens and the vision I had in the beginning just doesn’t work out – sometimes it takes on something completely different than I imagined, sometimes I just scrap it completely. In this case, I’m not sure if I should switch directions or not just yet. It’s still a “work in progress”. By the way, my very handsome model for this was my Army nephew. He was home on a very short leave before heading off to his next post. He’s been overseas for a year and now we’re just glad to have him back of US soil!!! This was taken on the day we had to send him back:( But I’m so happy he made time to sit for me. Thanks SeanE! Love you!